Today's post is brought to you by Lara Fraser (see bio below). 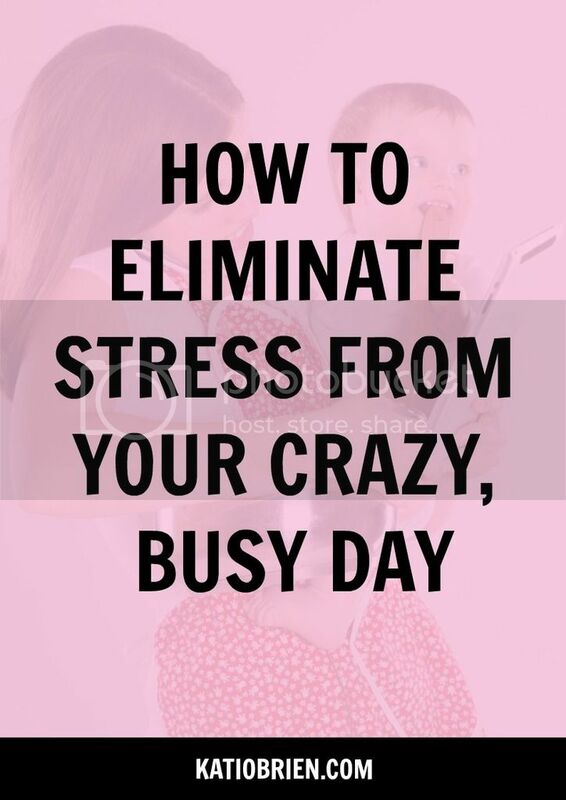 She's here to share with us her practical and useful tips for eliminating stress from our crazy busy lives! There were days when it felt like the entire world was simply spinning 100 miles per hour. It seemed that no matter how fast I moved or worked, I still only tackled half of what needed to be done. It was actually insane. That, my friend, was the past. Since then I have found ways to not only tackle my daily tasks but also how to get ahead and stay stress free. Heads up! Some of these tasks are going to take commitment and effort. It’s not just a magical word or quick-fix deal. I have both immediate and long-term tips, but even the immediate ones aren’t simply a snap-of-the-finger fix. That’s why I’m telling you that in order to become stress free, it’s going to take commitment and effort. These are the changes you can start making right now in your day to reduce stress and anxiety from your crazy busy day. Spend less time on social media! The average person spends… well, I don’t have an actual stat, but I know it is outrageous. The time you spend on social media is totally not worth it and it is time you could be using so much more efficiently. So put the phone away and get off your web browser and start actually working. Side note: For those of you (like me) who use social media to promote your business or blog, I understand the importance of social media. My solution? Use an app (such as Buffer or Edgar) that you can create all your social media updates on and then schedule them for different times throughout the day. That way you can quickly get them all out of the way and not have to worry about it again later on. Take time alone. You don’t need to have social anxiety to get stressed by constant socialization. Between the perpetual noise and all the annoying people out there, being around people without a break is so totally anxiety-provoking. Because of that, you need to take time to just be by yourself and have silence. Prioritize. So important! I love making lists and checking off things as I do them. This will help you get a better idea of what needs to get done how soon. Take mini breaks as opposed to long breaks. Studies show that it is better to work in 30 minute intervals with 10 minute breaks in between. This gives your brain a chance to absorb what it’s taking in and to rest so it can better perform for the next task. Wake up early. I figure this one will be the hardest for most people, especially all those teenagers out there who like to sleep in until 12 noon. However, by waking up early you can accomplish so much if you set your mind to it. And by getting more stuff done, you can reduce much stress. Exercise. Once again, this one is going to require commitment but is totally worth it! Exercise creates endorphins and other happy hormones that help reduce stress and anxiety. Plus, it’s good for you, so just do it. These are the fixes that will take time and application before you start to see a change. But I promise they will help you and are worth the wait! Get enough sleep. So vital to your mental health! Stress and anxiety preys on people who are running on less than 7-8 hours of sleep. Sleep is when your brain sorts through the information you have taken in during the day, deciding what is important to keep and what is unnecessary and can be chucked out. It’s a time of recovery for your mind as well. So get your sleep! Taking care of yourself is never a waste of time. Don’t leave things until the last minute. This one is pretty obvious I hope. If you leave your work and tasks until the last minute, you’ll be beyond stressed trying to get them all finished. Remember that just because something isn’t due in the immediate future, doesn’t mean its not due eventually. So if you have free time, get those things done. Even if they are far into the future, don’t neglect their importance. Have a do-nothing day. Our bodies were not meant to run 24/7 and therefore require a break at some point. That’s why I take one day a week to rest and recover. On this day you can do whatever makes you happy and reconnect with those you love. I know you are crazy busy and you don’t have time to take a day off… but the truth is, you do. You can take a day off if you are applying yourself and working hard the rest of the week. Do what you love. This one is probably the most important. If you are working at a job you don’t love and don’t enjoy, you are going to be stressed out and angry regardless if you have a large workload. But when you are happy to go to work in the morning and you are using the skills you love, it will eliminate so much stress. Sure you will still get stressed out, but not as much as when you were doing what you hated. Now you have the tools you need to eliminate the stress from your daily schedule, so start making some changes! Maybe you’ll need to rework some things or create a new schedule for yourself, but whatever it means take a leap and do it! You have no excuse now. If you need help figuring out a new schedule, check out my post about my morning routine and how I demolish a grand portion of my to-do list. You can see it here. That’s it for now! Have a great week my friend making new goals and becoming more efficient in your work schedule!